Nicole’s research focuses on trust development and repair in organisational contexts, and in contexts where trust or legitimacy are challenged (e.g. after a trust failure, in complex stakeholder environments, in telemedicine, during organizational change, in cross-cultural relations). She also researches in the fields of teams, leadership and workplace stress and well-being. 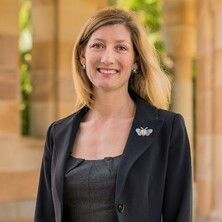 Her research appears in leading international journals, including the Academy of Management Review, Journal of Management, Journal of Applied Psychology, Organization Studies, Business Ethics Quarterly, Human Resource Management, Sloan Management Review and Work and Stress, as well as in books and book chapters. Her work has been extensively presented in Europe, the USA and Australia. Current research projects focus on understanding stakeholder trust in organizations and industries, the repair of trust, the antecedents of trust in multicultural teams, and stakeholder trust and uptake of Telehealth. She is on the Editorial Boards of Leadership Quarterly and the Journal of Trust Research. Nicole is dedicated to translating her research into practice and she has written commissioned reports on Building and Repairing Organizational Trust for the Institute of Business Ethics in London (sponsored by PriceWaterhouseCoopers) and a policy note on restoring trust in the financial sector for the House of Lords, UK Parliament, as well as numerous research reports for industry. Her research has been featured in numerous media articles and she has consulted and conducted research for a range of public and private sector organisations (e.g. UBS Bank, Barclays, CSIRO, BHP-Billiton, Origin Energy, Santos, The Royal Brisbane & Women’s Hospital, The Australian Army etc). She is a regular speaker at conferences and round-tables for industry and government. Journal Article: How do controls impact employee trust in the employer? Book Chapter: Trust differences across national-societal cultures: Much to do, or much ado about nothing? Journal Article: Models of Interpersonal Trust Development: Theoretical Approaches, Empirical Evidence, and Future Directions. How do controls impact employee trust in the employer? Trust differences across national-societal cultures: Much to do, or much ado about nothing? Models of Interpersonal Trust Development: Theoretical Approaches, Empirical Evidence, and Future Directions. Organizational trust: A cultural perspective. Edited by Saunders, M., Skinner, D., Dietz, G., Gillespie, N. and Lewicki, R. J. Cambridge, U.K. ; New York, U.S.A.: Cambridge University Press, 2010. Transformational leaders of project teams: Who are they and what difference do they make? Cross-modal links in exogenous covert spatial orienting between touch, audition, and vision. A, 60 (4), 544-557. Do participants in an enhanced skin self-examination using digital dermoscopy study worry about melanoma? Is ‘corporate tax maximisation’ an unthinkable? The stress effects of abusive supevision, bullying and ostracism in organisation, an the benefits of emotional intelligence training.